The FM radio talk show starts at five in the afternoon and ends atl eight in the evening on Home Radio. DJ Jimmy Bondoc describes his gig with Duncan Ramos as a free-flowing discussion about anything that catches their interest. Home Radio 97.9 FM has a format called “Natural.” A Filipino translation of "being yourself," in English: which further translates to "not being contrived" and "free-flowing." Just like Jimmy Bondoc said. from The Boys of RNB talk radio. Unlike other FM radio talk show formats, the two DJs do not rely on planned topics nor set ideas to discuss for each time frame during their stint. Their FM talk show is about them being themselves, talking about having fun and belting out a song every now and then for their devoted listeners. Aside from the radio talk show and special live performances and singing gigs, both Jimmy and Duncan spend a lot of time keeping fit with a healthy lifestyle, which includes running their own personal businesses: banking on solid investments for their future. A typical day for Jimmy starts with light morning exercises. Physical activity for his body and singing to train his voice. He allows himself a few moments before getting up. He drinks his morning chug and gets as much fluids as he feels is needed during and after exercise. Then he practices speaking in his normal voice before singing his favorite tunes. You will never catch Jimmy with slurred speech, he is sharp and engaging the moment he gets going in the morning. He also runs at least three times a week when his schedule permits. But if you ask him, he would prefer to run everyday. Jimmy also plays basketball with his friends and even enjoys the occasional golf game. All his efforts with keeping fit are paying off too. He looks lean and taut, and saunters around easily like an athletic person with good cheer. Jimmy is particular about eating healthy too. He says: “I try to eat the best healthy foods at home.” Although, he admits to enjoy the occasional greasy fried chicken and rice value meals at fast food takeouts. But as much as possible Jimmy prefers foods with less sugar and unprocessed grub. He also tries to influence as many people as he can with his healthy lifestyle. He has already helped his parents with healthier meal ideas. Jimmy constantly reminds his mom and dad about eating healthy and he even checks on their food purchases once in a while. He believes that somehow, his parents have developed a “food conscience” and learned from their son how to listen to their own body for vital health warnings. To avoid ailments. Jimmy was able to influence another important person about healthy eating: his friend, Duncan Ramos. Although for Duncan, an active lifestyle has always been a part of his life with the Taekwondo Junior National Team when he was younger. Apart from this, Duncan is also enjoying basketball, kick boxing, Muay-Thai, and he also dances as a fitness workout. Duncan aspires to join a triathlon next year – he expects the preparation for the event to really affect his schedule because the training requires staying fit for an endurance event. For the meantime, running works best for Duncan. He also follows a “one rice” per day diet. He considers is body as not the only thing he likes to keep in shape. Duncan sings to keep his voice one of his best assets. He sees to it that he gets a lot of breathing exercises to sing better. Duncan says: “Singing well is breathing right: Parang sa swimming, tama dapat ang pace or mauubusan ka ng hangin, sa pagkanta kapag naubusan ka naman ng hangin, mawawalan ka talaga ng boses, (Just like in swimming, you pace how you breath or you run out of air, when singing, if you don't breath right you lose your voice).” So he sees to it that his breathing stamina is always good. In fact, he even confessed that drinking cold water is not necessarily a bad thing for one's voice. He explained that cold water has more oxygen which the throat may need after a strenuous singing gig. As a form of recovery and healing ritual after a singing event. In fact, Duncan is in tip-top shape that he can perform well for hours just singing: “I can sing for four to five hours straight! But can only talk on their radio gig for an hour straight without resting.” He says his throat gets sore from talking on the radio show than from singing live at gigs. Sleep is very important to Duncan Ramos, although he may not have the regular sleeping schedule as most people have. Since he works on a late afternoon show, he kills time by taking naps early in the day. He also values short, but invigorating sleep time rather than long hours of light snooze time. The two celebrity DJs may have earned the respect of many fans and local radio industry honchos, but it doesn’t mean they are complacent about their careers..
Jimmy grew up in a family of musicians who were also running a business. He learned to merge what he learned from his family's disciplined approach and apply this to his career. “I employ as much discipline into my craft as I have learned, and I never compromise keeping myself focused,” he said. He knew life as a celebrity musician was a challenge and many who ventured into the music industry did not succeed nor endure for long. That’s why Jimmy himself refuses to just settle for things being as they are with his career. This is reflected in how he manages his finances. Instead of living the high life, he invests smartly in developing good properties. He shares: “I am making the best investment in my own health, to avoid crippling illness, and I am investing in relationships with good people hoping that when the time comes, they will help me do good.” Yet, with all his property assets, his radio talk show celebrity and plenty of special singing engagements, Jimmy knows that he can never consider his future as set, nor a sure thing . And for Duncan Ramos, who also comes from a business-minded family, his share of business ups and downs have taught him well. In fact, he ran a posh entertainment bar for a while that unfortunately closed down. This was the time when he learned that he had to be choosy about projects to spend time on and to have genuine love for his business endeavors. He noticed that running the entertainment bar made him tense and stressed because he was already exposed to the hijinks of nightlife entertainment as a performer. He really wanted something different and less stressful so he ventured into other businesses. Duncan now has a recording studio as well as a boxing and dance studio. When he is not busy preparing for his radio gigs or concerts, he spends his time teaching martial arts at his boxing gym. “I love teaching kids how to fight." "Since you don’t really own anything (in this life), it is very humbling...kapag nakikita mo sila na natuto (when you see them learning),” confesses Duncan. He enjoys being able to share his fight skills with students especially to kids. But it wasn’t all fun times for him. He shares: “Not everything happened by chance, I really worked hard for everything.” When Duncan became part of South Border, he was only 20 years-old. And when the band disbanded no record label wanted to sign him up. But instead of losing hope, he learned to produce music on his own. It was a good thing that Duncan learned to love studying his own craft to become a better person. “I don’t get tired of learning, (I believe) that if one person can do it, everyone can do it,” he said. But he also believes that each person has something that he really excels at and a person must at least try to make the best of that thing. This is something which both Duncan and Jimmy believe in. When Duncan saw the music industry’s survival-of-the-fittest setting, he knew he had to take the initiative to make and create opportunities on his own. It was just a blessing that he was in fact a very skilled musician and could play several musical instruments like a pro. It made it less stressful to craft his own music in the recording studio. “Hindi lang dapat puro passion, kapag passion mo kailangan mo din kargahan (It’s not just about passion, it’s about being able to build on it and enhance it too),” he advised. Judging from how the two celebrity DJs live their young lives, it is certain that they will do their best to inspire other people to do good. And impart the wisdom of seasoned pros. 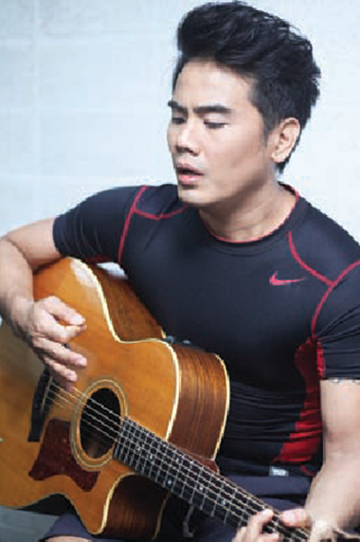 Jimmy Bondoc believes that being honest to one’s self is the key for success. There are things that a person may not be cut out for, or there may be things that a person needs to go through and going through trials and learning from them can only be the best for him or for her. He also strongly and sincerely believes that leaving room for God to point the right direction works best. He mentioned that being too sure of something can have its downside. Being cocksure might be because of one's determination to succeed, which is good. But it can also be pride, which is foolhardiness. “You might be banging your head against a wall that might not move,” he warned. “Like Bruce Lee, you have to be like water. Go with the flow, but have the beautiful dream in mind. Don’t be confined by numbed vision on just one path, you will miss opportunities along the way if you have blinders on,” he explained. “If you get what you want, be thankful. But if not, still be thankful with what you get,” he uttered with a knowing and thankful smile on his face. Duncan’s advice resembles the same values, but with a more pragmatic attitude and firmness. He believes that “following the heart” alone doesn’t always invite opportunities. It still needs a lot of thinking and a lot of obedience since not everything happens as one hopes it will happen. For Duncan, the key is “obey first before you complain.” Following the rules first so that you know how they work in your favor or how you can make them work in your favor to do good and not to take advantage of anyone. "Do not close off your mind from taking on the many opportunities that may come as you go along in life. Just like in sports, there is a method to life. “Minsan may ayaw ka, pero kailangan sa tamang paraan mo makuha gusto mo. (Sometimes, there are things you don’t like, but you have to stick to the right method to keep at it and get what you love),” Duncan explained. In fact, his radio show was one BIG challenge for him. Duncan Ramos was not used to working at an inconvenient hour everyday, it made the work feel like a day-job. 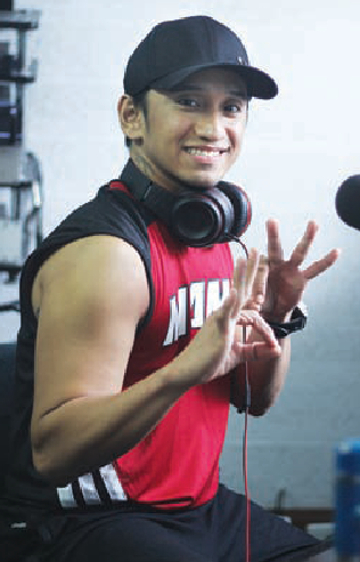 But as he explored the opportunities of the radio talk show, he learned to enjoy what the gig brought to their team and their music craft as well. If he didn’t give the job a chance, he would never have found out how blessed it was to hold the gig in tandem with Jimmy Bondoc. Which may spin off into more blessings in the future.